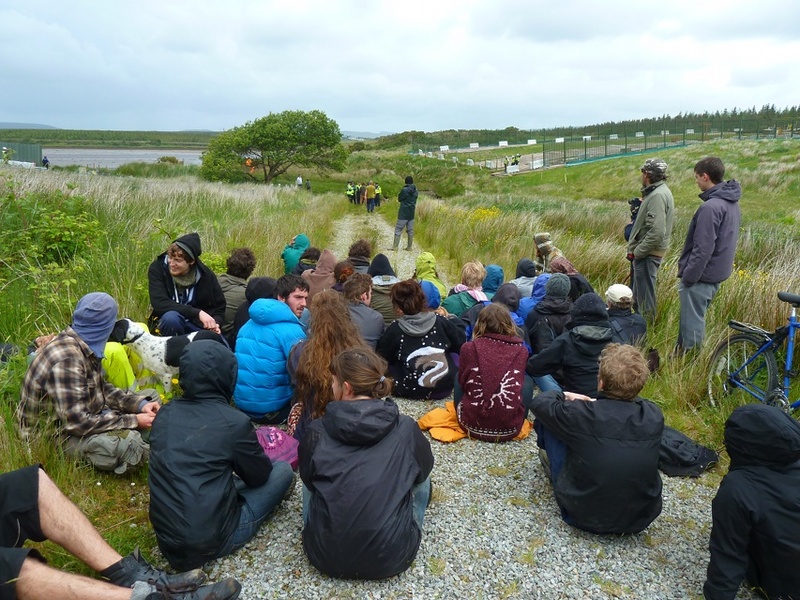 At 1pm, local residents, joined by supporters from the Rossport Solidarity Camp, which began its week of action on Friday, tore down fencing surrounding the Aughoose site and pushed past private security before trashing generators, water pumps and pipes, CCTV cameras, lights, other equipment and building supplies. As one witness observed, “Machines were making noises then they stopped making noises! Others started spouting water!” The compound is the base of the Tunnel Boring Machine (TBM), which is currently tunneling under the estuary to the landfall valve at Glengad beach. Earlier, a crowd had gathered at the gates of the compound to watch a powerful play about the history of the struggle, highlighting Shell's tactics over the years, which have included the near-fatal beating of one opponent and another having his fishing boat invaded and sunk by masked gunmen. Later, demonstrators gathered for a picnic lunch on a public footpath over which Shell are extending their compound in order to complete construction of the gas pipeline. This area was the site of action yesterday, when around forty people uprooted bog-mats (hard flooring for construction vehicles) and destroyed sandbags and surveillance to impede the construction of the fence. The Corrib Gas project, which was initially supposed to be active and pumping by 2003, now has two years left to completion by Shell's estimation. Today's actions show that they may have to revise their timeline again, as resistance remains strong.